‘Incredible’ is the most apt term to describe the character of Hulk. Children love his superhuman strength and the ability to grow powerful, as he gets angrier. On the positive side unlike Superman or any other comic hero who has superpowers through unnatural sources, the character of Hulk is a part of a human personality – Bruce Banner or his alter ego. So, there are more perspectives and dimensions to this famous superhero’s character. Here is one of the popular cartoon series, Hulk. 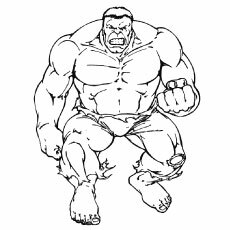 Check out the top 20 such fantastic Hulk coloring sheets that depict his different moods and actions. 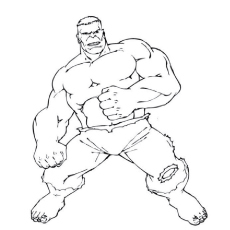 Your kid will surely enjoy these hulk pictures to color anytime. This picture has Hulk in his full force demonstrating his strong muscles and body tone. His fists and expressions demonstrate that he is in angry mood and ready to attack. The hugeness of Hulk makes him different from the rest of the supermen and this is evident in this picture. If you are introducing your children for the first time to character coloring, then this is good one to start with. 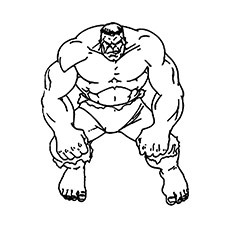 The picture shows Hulk in a mood to take revenge. When kids are given the same character with different moods for coloring, they start noticing how few strokes of lines here and there can change the facial expressions and learn to color the pictures better. 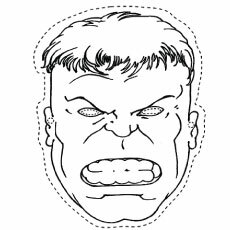 Children love to wear masks of superheroes and what is the better way to fuel inspiration than making them color the cut-out of Hulk face and making a mask from it to wear? You can help the kids in coloring the face appropriately. 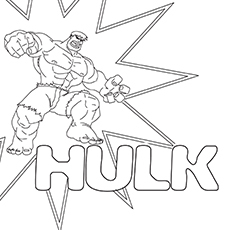 Hulk is seen as usual in an aggressive mood in this coloring page and is ready to fight. His super-powerful muscles and ribs demonstrate his body strength. 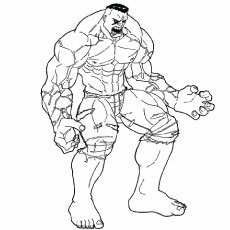 Make sure that you show the kids these images of Hulk so that they can properly color all the body parts and make the picture colorful. The face of Hulk in this picture is highly aggressive. One-half of his face resembles an aggressive animal such as tiger or lion, and another half is similar to his regular face. You should take care this is given only to school going children and not to nursery kids as they might find this frightening. 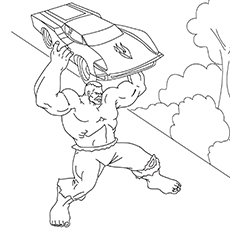 Hulk, in this picture, is shown picking up the car and is about to throw it down. The power of Hulk is quite evident from the ease with which he has picked up the car like a toy and is going to put it down. 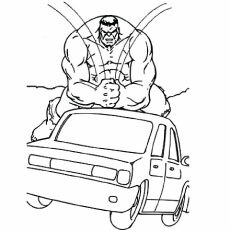 Along with the main character Hulk, your kids will enjoy coloring the car too. Hulk when becomes unconquerable by common protector of law, another superhero is needed to control him. This picture shows Spiderman, the leading superhero and favorite among the kids trying to control Hulk who seems to be in very destructive mood. Your kids will love coloring their two favourite supermen. Teenagers who like aggressive punches and fights usually love such actions. Hulk in this picture is shown crushing a car that clearly demonstrates his power and mood. This image surely will your children ample scope to color according to their wide imaginations. This picture shows Hulk using his super-strength against the Avengers. When Hulk goes beyond control, other superpowers have to interfere and control him. 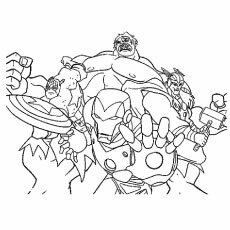 The image shows their favourite cartoon characters in action and will love to color them. 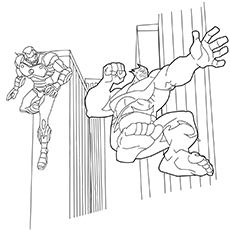 Along with Hulk, we can also see Iron Man and Avenger doing the action with skyscrapers at the background in this picture. 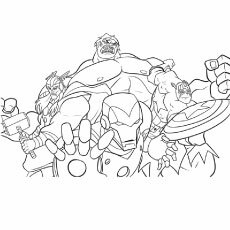 The teenagers and younger children will find a lot of things to color in this page and will gain experience at coloring multiple objects in one picture. The page shows Hulk running fast and aggressively to reach somewhere with multiple skyscrapers in the background. The kids, by coloring such pages, will get to know how to differentiate between the main character – Hulk in this picture and the other less important objects such as the buildings in the background and use the color shades and impressions accordingly. 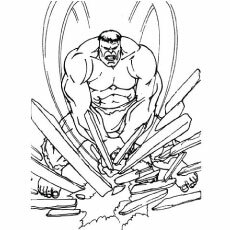 The picture shows Hulk crushing the wooden sheets and breaking them. 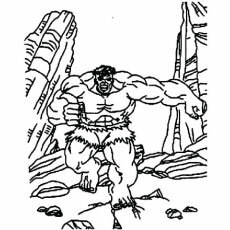 It is certainly one of the coloring pages depicting Hulk in his usual aggressive and steamy mood. 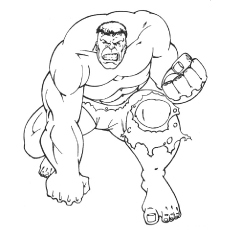 Kids, especially who know a lot about Hulk, can color this well and enjoy the coloring. 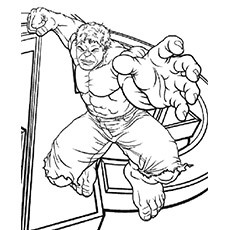 The coloring page has Hulk standing on a wooden plank or stairs trying to catch something or someone with his one hand. The palm itself looks large and strong, and demonstrates the overall hugeness of the Hulk’s personality. Your kids will get a good idea about coloring these type of images as it seems little difficult but will definitely enjoy. 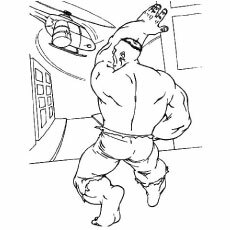 The picture shows Hulk looking for someone, holding and crushing the cushion with his hands. The pose and stride of the superhero is distinct, and match the ruthlessness for which he is so well known. Your kids can colorfully paint this image by using proper shades of colors. In this picture, Hulk is shown going after a helicopter to catch it. The image shows how tall and huge the superhero is and his enormity is clearly visible through his muscle toned back and legs. 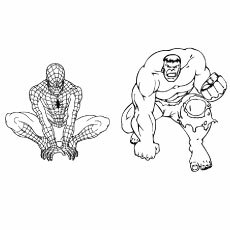 Although Hulk has his back in the picture, there is still a lot of element of power that your kids will find interesting while coloring. The Hulk is a fictional character or superhero that appears in comic books published by Marvel Comics. The character was created by Stan Lee and Jack Kirby. This character first appeared in the film called Incredible Hulk. 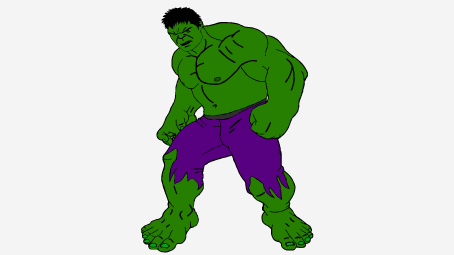 In the comic book Hulk is portrayed as a large Green humanoid that possesses superhuman strength and great invulnerability, these qualities become stronger when Hulk becomes really angry. The Hulk is the alter-ego of Bruce Banner, a socially withdrawn and emotionally reserved physicist who transforms into Hulk under emotional stress and other specific circumstances. When transform Hulk behaves differently from his alter ego Bruce Banner. These involuntary transformations make Bruce’s life complicated. 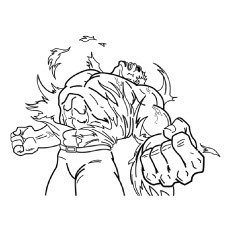 In this picture we see Hulk is showing off his muscles as a mark of victory. Hulk has a well-built physique while comprises of numerous muscles that give him super human strength. Make sure your child colors the Hulk green. If your child has already watched the film Avengers he will not need much guidance. The background is kept plain, so that your child can use his discretion and fill it inwith his favorite colors. 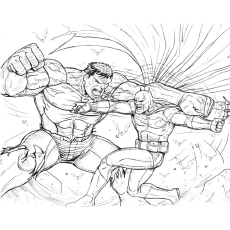 Children admire superheroes and the angry Hulk must be their favorite! 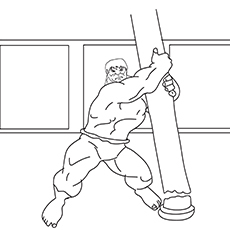 So your child will definitely love coloring this muscular Hulk. 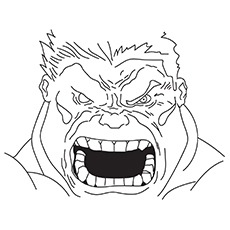 When Hulk is angry, he absolutely loses control. In this picture we see Hulk is breaking the pillar with his superhuman strength. Maybe he is planning to attack his enemy with the pillar. He can turn ordinary objects into powerful weapons. 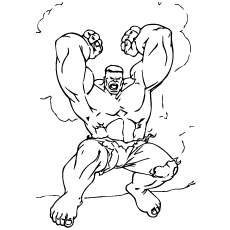 Your child must have seen this scene in the film ‘Incredible Hulk’ and will be excited to color this picture. The Avengers, is a 2012 American superhero film based on the Marvel Comics superhero team of the same name, produced by Marvel Studios and distributed by Walt Disney Studios Motion Pictures. The Avengers come to the defense of New York City, especially the Wormhole’s location. They suddenly realize that they may be attacked by the waves of Chitauri who are descending upon Earth. Banner transforms into Hulk and together with Tony Stark, Rogers, Thor, Barton and Romanoff battle the chitauri, and evacuates the citizens. Hulk finds Loki and compels him to surrender after a fight. Romanoff goes to the Wormhole’s generator where Selvig reveals that Loki’s scepter can be used to shut down the generator. Meanwhile, Fury’s superiors attempt to end the invasion by launching a nuclear missile at Manhattan. Stark intercepts the missile and takes it through the wormhole toward the Chitauri fleet. The missile detonates, destroying the Chitauri mothership and disabling their forces on Earth. Stark’s suit runs out of power, and he falls back through the wormhole just as Romanoff closes it. Stark goes into free-fall, but the Hulk saves him from crashing to the ground. In the aftermath, Thor returns Loki and the Tesseract to Asgard. Fury expresses confidence that the Avengers will return if and when they are needed. The teams of Avengers are always ready to help the city of New York. This is a poster for your kids who are addicted to superhero films. If they have watched the film Avengers, they will definitely love coloring the picture. It is a perfect poster for kid’s superhero themed room. Your little one must be addicted to superhero films and videogames. So this picture will be perfect for his super hero themed room. This poster of Hulk with the film’s title ‘Incredible Hulk’ will become even more special when your child colors it. He will want to show it off to his friends his art work and learn to take pride in his work. Your appreciation will make him really happy. 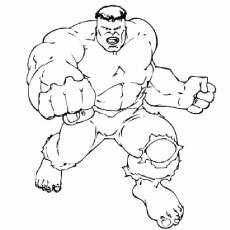 If your kid loves action heroes, especially the angry young man who turns to a green monster, these free printable hulk coloring pages are bound to keep him occupied for several hours at a go!